There are total 4 types of connection method that you can use to access the Internet: Cable, Repeater, 3G/4G Modem and Tethering. Click INTERNET to create an Internet connection. Connect the router to the modem or main router via Ethernet cable to access the Internet. 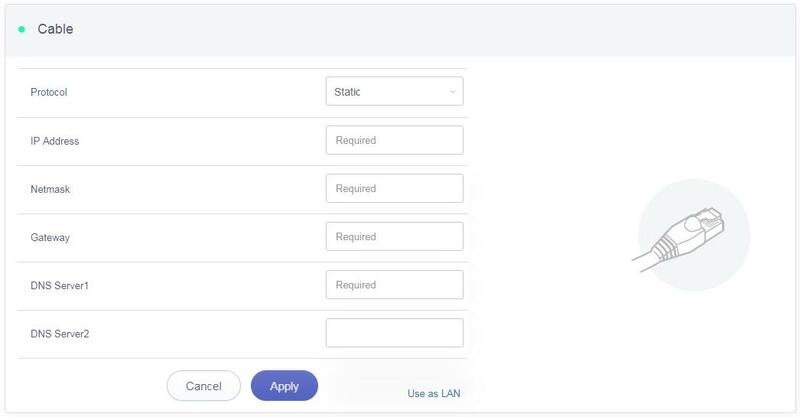 Before plugging the Ethernet cable into the WAN port of the router, you can click Use as LAN to set the WAN port as a LAN port. That is useful when you are using the router as a repeater. As a result, you can have one more LAN port. Plug the Ethernet cable into the WAN port of the router. The information of your connection will be shown on the Cable section. DHCP is the default protocol. You can click Modify to change the protocol. DHCP is the default and most common protocol. It doesn't require any manual configuration. Static is required if your Internet Service Provider (ISP) has provided a fixed IP address for you or you want to configure the network information such as IP address, Gateway, Netmask manually. The current settings will be automatically filled once you choose Static. Change it according to your needs and then click Apply. PPPoE is required by many Internet Service Providers (ISP). Generally, your ISP will give you a modem and provide you a username & password that you needed when you are creating the Internet connection. Under PPPoE protocol, enter your username and password, then click Apply. 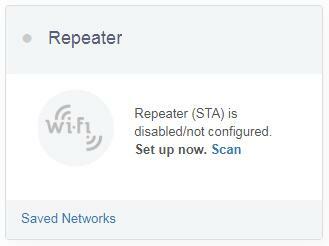 Using Repeater means connecting the router to another existing wireless network, e.g. when you are using free Wi-Fi in a hotel or cafe. It works in WISP (Wireless Internet Service Provider) mode by default, which means that the router will create its own subnet and act as a firewall to protect you from the public network. In Repeater section, click Scan to search for the available wireless networks nearby. Choose a SSID from the drop-down list and enter its password. You can also enable the Remember button to save the current chose wireless network. Finally, click Join. You can connect to the Internet using a USB 3G/4G modem. Insert your SIM card into the USB modem Plug the USB modem into the USB port of the router. Once it has been detected, the 3G/4G modem section will be activated and you will be able to set up your USB modem. Be aware that some modems work in host-less mode, which will be configured through Tethering but not 3G/4G modem. In General, you can set up your 3G/4G modem by the three basic parameters below. Click Apply to connect. Device: Choose /dev/cdc-wdm0 if your modem supports QMI, otherwise you need to choose /dev/ttyUSB, which may include several ttyUSB from 0 to 3. You need to choose the correct one based on the modem spec. We suggest you to try ttyUSB0 first. Service Type: Indicate the service type of your SIM card. APN: Confirm with your SIM card carrier. Pincode, Username and Password: Generally, these are not necessary for an unlocked SIM card. However, if you have a locked SIM card, please consult your service provider. It is connected when the IP address of your SIM card shows up. Here is a list of supported modems that we had tested before. *QMI: This modem supports QMI mode. Please choose /dev/cdc-wdm0 in the Device list. *Host-less: This modem supports tethering mode, please set up by using Tethering but not 3G/4G modem. You can also refer to http://ofmodemsandmen.com/supported.html for a well supported modem list. Using USB cable to share network from your smartphone to the router is called Tethering. Host-less modem works in Tethering during the setup of the modem as well. For host-less modem tethering, plug it into the USB port of the router. For smartphone tethering, connect it to the USB port of the router and click Trust to continue when the message pops up in your smartphone. After plugging in your device, the Tethering section will update and your device will be shown on the device list. The device name will begin with eth or usb such as eth2, usb0. Choose your device and click Connect. Some carriers prohibit the sharing of the data so that you may not be able to use tethering. However, you can try easytethering. Note: Easytether is not a free service and we have no affiliation with them.